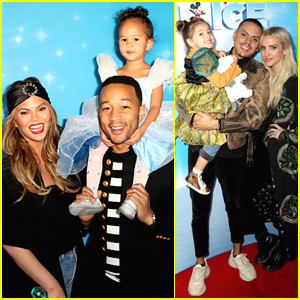 Chrissy Teigen and John Legend are all smiles as they bring daughter Luna, 2, to the Dare to Dream Celebrity Skating Party hosted by Disney on Ice on Friday night (December 14) at the Staples Center in Los Angeles. Famous families including Ashlee Simpson and Evan Ross along with their daughter Jagger, 3, Vanessa Lachey and kids Camden, 6, and Brooklyn, 3, Haylie Duff and husband Matt Rosenberg and daughter Ryan, 3, Kendra Wilkinson brought kids Hank, 9, and Alijah, 4, while Malin Akerman and new husband Jack Donnelly brought her son Sebastian, 5, to the event. Other stars at the event included Viola Davis, Megan Fox, Ty Burrell, and Jenna Dewan. Michael B. Jordan is dapper as he flashes a smile on the red carpet at the 2018 GQ Men of the Year Party held at a private residence on Thursday (December 6) in Beverly Hills, Calif. 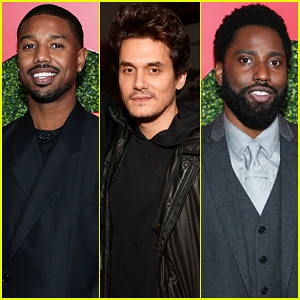 The 31-year-old Creed II star was joined at the event by John Mayer, John David Washington and his BlacKkKlansman co-star Topher Grace, If Beale Street Could Talk star Stephen James, Lena Waithe, Andrew Rannells, Robbie Rogers, Evan Ross, Nyle DiMarco and Adam Rippon. 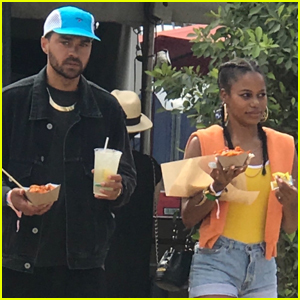 Also in attendance at the event was musicians Tyga, Ne-Yo, Swae Lee, Ty Dolla Sign, Pete Wentz, as well as Queen Sugar‘s Kofi Siriboe, Rampage‘s Jack Quaid and girlfriend Lizzy McGroder, SNL‘s Jay Pharoah, Grown-ish‘s Trevor Jackson, Steelo Brim and Elijah Funk. FYI: Topher is wearing a Jaeger-LeCoultre watch. Stephen is wearing Giuseppe Zanotti shoes. Jack is wearing Strong Suit. Kofi is wearing a Darkoh tuxedo. Ashlee Simpson & Evan Ross Release 'I Do' Acoustic Music Video - Watch Here! Ashlee Simpson and Evan Ross are getting ready to go on tour! The couple recently announced that they will be hitting the road for the North American leg of their tour starting in January 2019 where they’ll be performing songs off their EP ASHLEE + EVAN. The duo also just released the acoustic music video for their ballad “I Do” – which you can watch below! Evan and Ashlee recently celebrated Thanksgiving with his entire family on a float during the 2018 Macy’s Thanksgiving Day Parade. You can buy tickets to Ashlee and Evan‘s tour at their website here. Diana Ross shows off her all white outfit while stopping by the Diana Ross Playground in Central Park during the 2018 Macy’s Thanksgiving Day Parade on Thursday (November 22) in New York City. The legendary entertainer was joined by her entire family while riding a float in the parade. Along for the ride were kids Tracee Ellis Ross and Evan Ross with wife Ashlee Simpson, among others. Ashlee and Evan brought along her 10-year-old son Bronx and their three-year-old daughter Jagger for the festivities. FYI: Ashlee and Evan are wearing DROMe coats. Ashlee Simpson & Evan Ross Have a Night Out in London! Ashlee Simpson and Evan Ross are having a lovely time in London! The musical couple were spotted on their way to dinner at Bagatelle restaurant on Wednesday night (November 7) in London, England. Ashlee and Evan looked stylish as they later headed to The Chiltern Firehouse. Earlier in the week, Ashlee took to her Instagram to share a fun shot while she grabbed a bite to eat during a break from work. “Taking a quick promo break, enjoying the @Carlsjr Famous Star Burger. ⭐️ This burger deserves a photo moment of its own!” Ashlee captioned the photo. Ashlee Simpson & Evan Ross Make It Date Night in London! Ashlee Simpson and Evan Ross hold hands as they leave a restaurant after dinner on Tuesday night (November 6) in London, England. 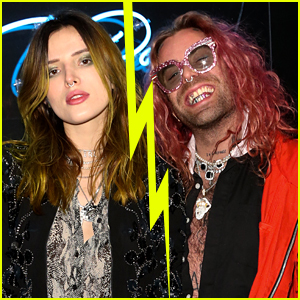 The 34-year-old singer looked super chic in a white jumpsuit covered in black polka dots while the 30-year-old actor/singer rocked a burgundy, velvet suit and leopard-print dress for a super stylish night out on the town. The hot couple was in town to attend the 2018 MTV EMAs over the weekend where they hit the stage to present the award for Best Pop to Dua Lipa.